Attention my fellow China neighbors, please visit the U.S.on a day like today in Chicago and experience what blue skies, green water and clean, clean air feels like. I can’t help myself from constantly gazing at the skies here and giving thanks for the U.S. laws that we impose on cars, industries, etc. that keep it this way for us to live in an environment that isn’t hazardous to our health. You can yap all day about less government in our lives (yes, I’m talking to you Tea Party People) but that oversight keeps us safe. Seriously, people who make it happen in China need to wake up and smell the clean air that is possible. The people of China deserve a healthier environment to raise their families and live their lives. Most citizens don’t ever leave their homeland so they have no idea what is possible and what it feels like. I read in the state newspapers that pollution regulations are a priority so I can only hope that they mean it. I know my body can only take it so much longer and I will need to return to breathe clean air again and renew my lung capacity. 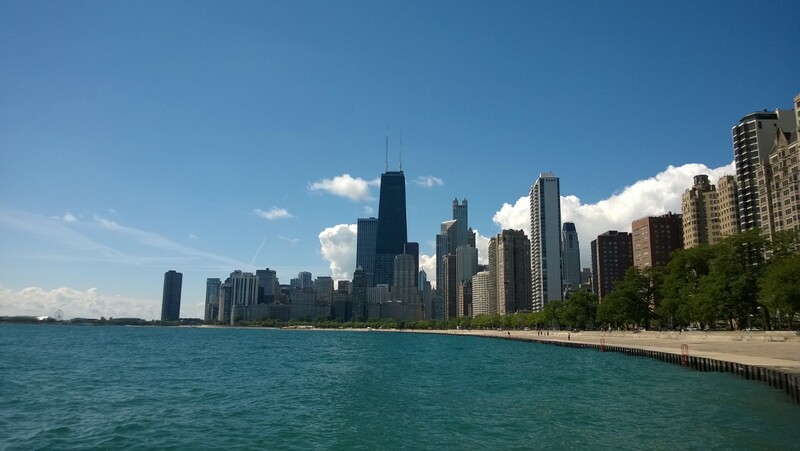 Today, I got up and walked the Chicago waterfront enjoying the beautiful Lake Michigan green waters and clean sandy beaches. Everyone was out early playing beach volleyball and staking their claim to a prime spot on the beach. A non-profit was promoting ice cream for donations so I bought a homeless woman a treat to enjoy on this sunny day. There are definitely more homeless on the streets in Chicago than you see in China. I wonder if that is because of the cultural traditions of taking care of family in China. I’m now sitting outside a Starbucks to enjoy my treat, a Chai Latte. Yummy gingerbread milk on a lovely sunny cool day in the US of A. Doesn’t get any better than this…except when I pick up my beautiful daughter Hannah and Baby Mia today in Chicago and take them for their first visit to GreatGMA Gene and Great Aunt Becky in South Bend. We get to spend some quality time with friends and family before I head off to Atlanta for meetings and Hannah heads to Idaho for a friend’s wedding, Mia’s first. I can only imagine the fancy headband that she will be sporting with her pretty dress. Life is good. 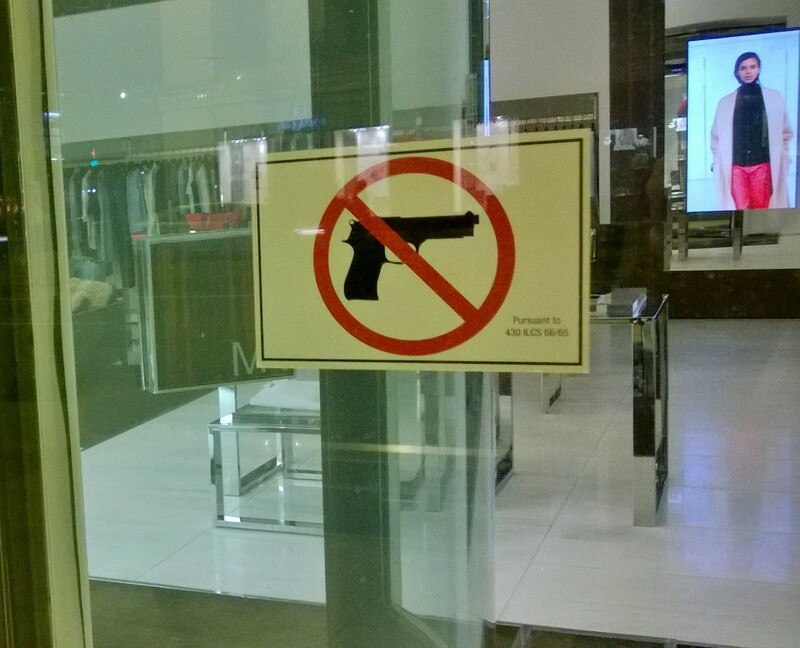 I knew I was back in the USA when I saw the “No Gun” sign posted prominently on the door of the boutique in Chicago. Unbelievable that this preventative action is required to alert all gun-toting shoppers to check their artillery at the door or no Michael Kors for you! Probably just a fashion statement vs. a safety precaution because, really, the gun holster would ruin the look of the outfit. Only in the U.S. do you need to post this sign to high end shoppers! Arriving in Chicago from Shanghai, I was hyper-aware of the culture differences from the moment I landed. Delta Sky Club-I’ve missed you! Though the massage chairs are nice in the VIP Lounge in Shanghai, I appreciated the sensory overload from all the TV news shows and newspapers offered in the Club. Heaven for a news junkie like me! I miss hearing all the horrible uncensored news about humanity-makes you appreciate your own life more. Deciding that I needed to be thrifty since this part of my trip was personal, I decided to save a few bucks and wander around O’Hare to find the Blue Line CTA train to take me to downtown Chicago. Now, doing this late in the evening by myself and never having done this before was probably NOT my brightest idea. Honestly, I felt safer in China than I did at that moment in my home country. After an unhelpful bored CTA attendant told me to use the machines and rolling her eyes at my request for help, she proceeded to give me wrong directions. I hopped onto the train with about a million TSA agents going home for the day, which made me feel only slightly safer, and immediately noticed that the trains were much dirtier than in China. Interesting. The layout for passengers in China is for maximum capacity with benches along the side to cram people in and lots of hand holds from the ceiling. None of that here–just individual seats molded into shapes to accommodate the larger American posterior. Sorry, but it’s true. Jumping off the train after about 14 stops, I had called the hotel and found out the nearest station and it was definitely NOT the one the CTA agent had told me. Glad I’m not a trusting soul. Trying to cram my large suitcase through a turnstyle to get out, a very helpful Chicago citizen assisted me when I got stuck. What the Hell!! Who builds a tiny turnstyle for a mass transit exit! Much more efficient in China to just walk through gates to get out quickly. Grabbing a taxi was easier than I thought it would be and off to the hotel I went, forgetting to tip the poor driver because, in China, tipping is not done. Sorry dude! I’ll have to cash in some $$ to spread around. 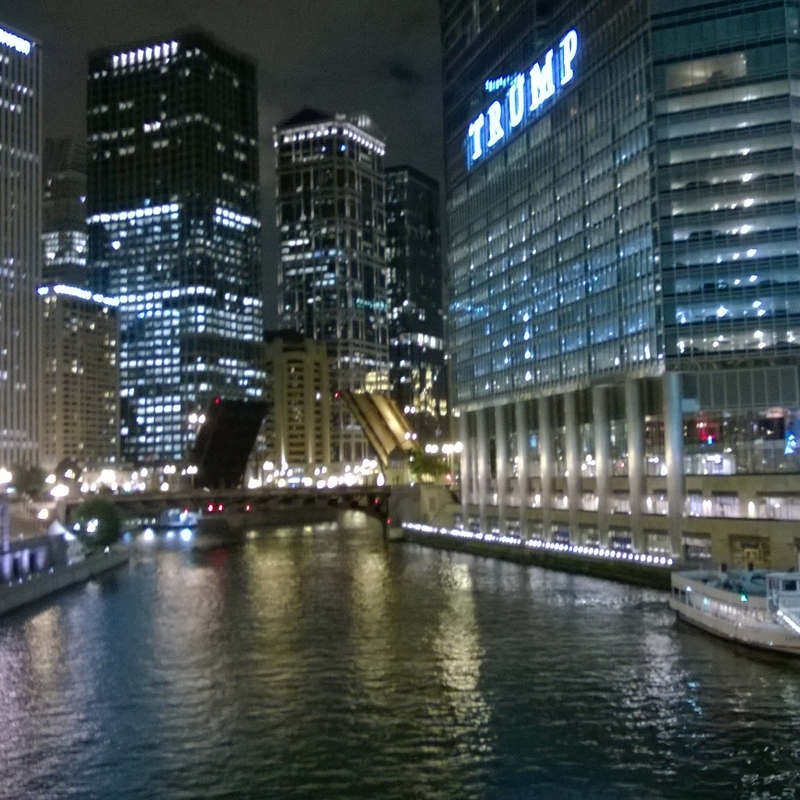 Even at night, the Chicago River looks cleaner than the Haungpu River! After being in a plane for a day, I quickly went for a late night walk along the Magnificent Mile. Seeing the China Union Pay credit card sign in the Gucci window made me feel at home–you can tell who their primary customers are! Here, the large three story retailers are Crate & Barrel vs. Prada. Culturally, the Chinese like to wear or drive their wealth vs. buying home fashions that can’t be shown off in public. It’s a status thing. I also noticed far fewer luxury cars here vs. the gold plated Lamborghini I saw last week in Beijing. No small display of wealth there! The streets were quiet and the cool weather was probably keeping all the diners inside vs. on the outside patios. What a pity! I can’t wait to get out tomorrow and walk around this beautiful city before picking up my daughter and Baby Mia to go see family. GMA Gene and Great Aunt Becky, here we come!